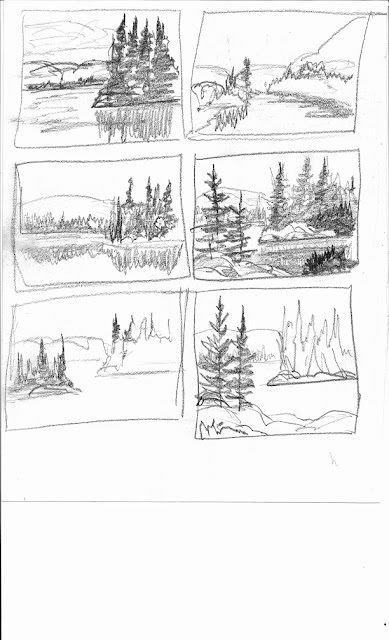 Using thumbnail drawings to work out an idea. I've been thinking about this blog for a while now as is evident from the time since my last one. We've all heard about the importance of drawing skills but sometimes you just have to doodle to get to an idea for a painting or to work out a suitable composition before you commit paint to canvas. Now doodle, in this case, is more correctly named thumbnail sketch. I use this term since it is one that I was taught in my advertising and graphic design days as a way to work through many creative ideas in the least amount of time. As you can see I divided up the page into a number of squares and started to place landscape elements in a number of variations. Funny thing here is how close I came to my final idea at this stage. Come back to this picture later to see which one made it through! You can see in the image above how I tried out different types of trees, right or left placement and how much background I wanted to reveal. 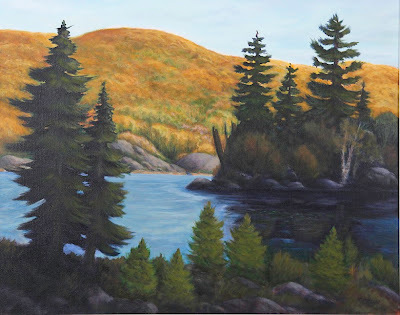 I knew I wanted a Fall painting and I also knew that in order to create depth the background hills needed to take on a larger roll while the foreground trees led the viewer into the picture. 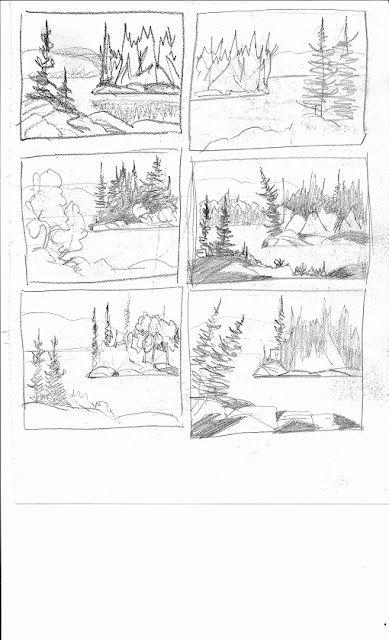 Here you can see that I strayed from my original composition as I tried out a broad vista view ( top right and middle left thumbnails) but quickly moved back. 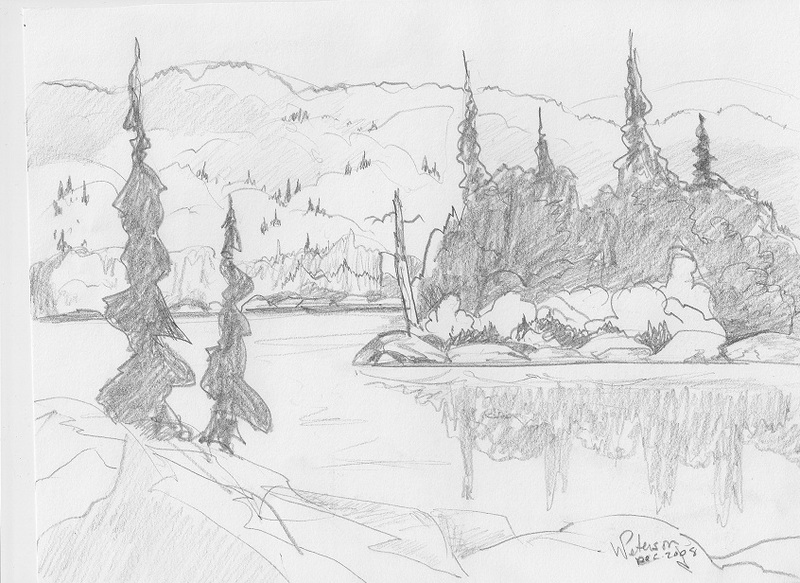 All through this process I am looking at each element's position on the picture plain and its scale in relation to the foreground, mid ground and background. I also keep an eye on their relation to the edges of the "canvas". These thumbnails took about 20 minutes to do. 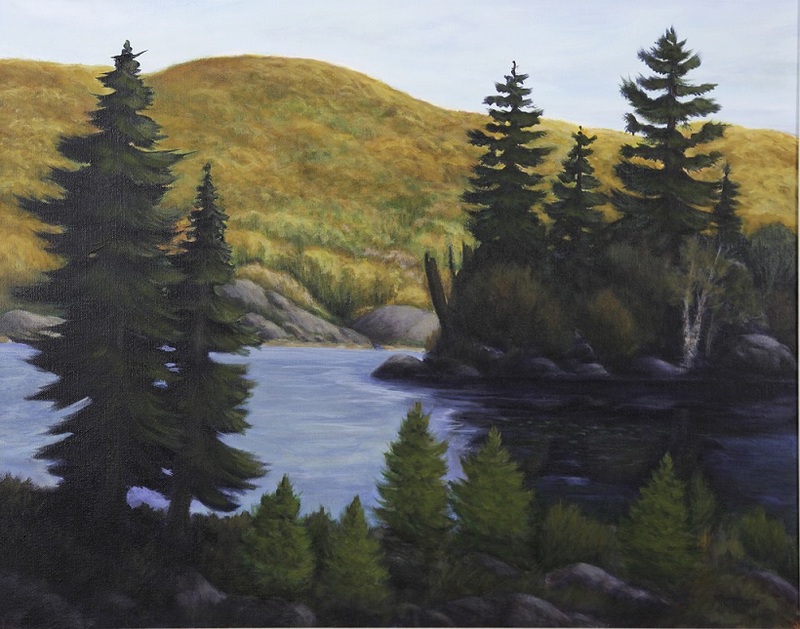 As I worked through the final painting I felt that bare rock in the foreground was too stark so I added some new growth to illustrate renewal in contrast to the dead tree truck overhanging the water on the island. 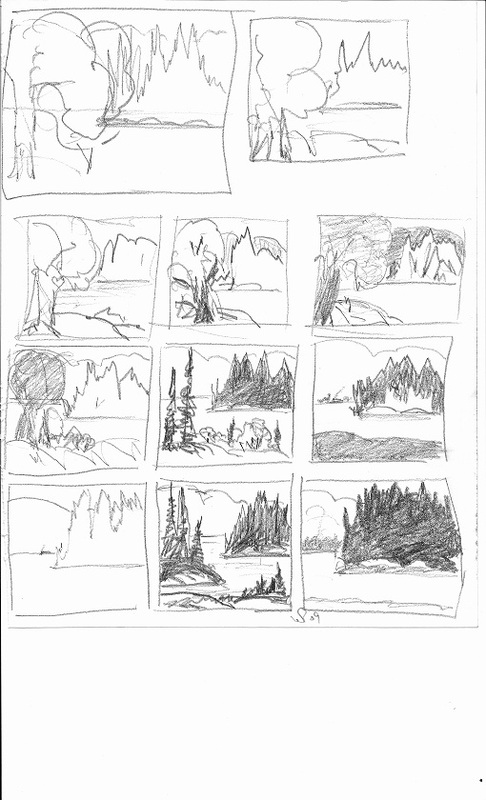 Working out painting or any other idea through thumbnail sketches is an efficient use of time and materials and is a great way to stimulate new ideas or to explore a theme. I have a painting demonstration on my web site that shows you how I take the rough outline on the canvas to a final painting. It's a quick read so come by and click on the Demonstration tab at my web site.